Bulgarians celebrate on every March First an antique tradition of exchanging good wishes of ‘Health and Happiness’. They call this day ‘Баба Марта’- Baba Marta – (‘Granny March’), a name of a mythical figure who brings with her the end of the cold winter and the beginning of spring. It is a tradition to give friends, neighbors and family members a red-and-white interwoven strings. These two interwoven colors symbolize health and happiness, as well as lucky charm against evil spirits during the year. Most of all, it is a reminder that spring is at hand. 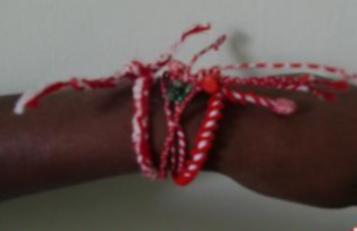 These red-and-white strings or wrist bands are called ‘Martenitsi’ in Bulgarian. They are worn around the wrist or on the clothes, through the month of March, until trees are seen to bloom, grow leaves and give sap greens, which symbolizes warmer weather and well being. In the villages people decorate their houses with martenitsi, as well as their kids and their domestic animals. The combination of red and white has many explanations. The common belief for Christians, is that ‘red’ stands for ‘life/birth’ while ‘white’ signifies ‘anew’; having combined these two colors together, would mean ‘newborn’, ‘rebirth’. Another explanation is that white stands for wisdom and red stands for good health; in Bulgaria, this is a celebration of new life and survival of winter season.